Super Savings Item! 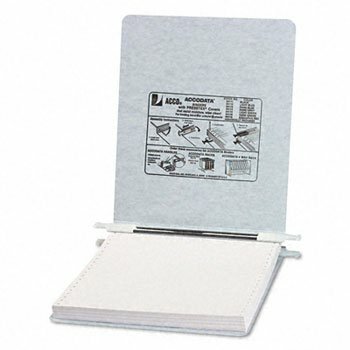 Save 39% on the ACC54114 - Acco Pressboard Hanging Data Binder by ACCO Brands at Marco Marcucci. MPN: ACC54114. Hurry! Limited time offer. Offer valid only while supplies last. Top and bottom loading binder expandable for various sized projects. Retractable storage hooks for single point or drop file hanging systems. Top and bottom loading binder expandable for various sized projects. Retractable storage hooks for single point or drop file hanging systems. Adjustable flexible nylon posts allow maximum capacity with minimum storage space. Embossed acrylic-coated pressboard cover resists moisture and scuff marks. Designed for use with sheets that are still attached in continuous form with accordion fold. Capacity Range Max: 6amp;quot; Colors: Light Gray Binder Sheet Size: 9 1/2 x 11 Binder Style: Non-View. Print File Oversized 3 Ring Binder for B or HB 11" x 9-3/4" Print Preservers & Pages.